It’s nothing new, but fact is: the rich are getting richer. Unfortunately whenever I write something like this, I’m going to alienate some readers, but I genuinely believe that, in Australia at least, everyone has the opportunity of becoming wealthy. However, last year Oxfam’s Working For the Few report showed that the world’s richest 85 people own as much wealth as the poorest 50%, with the top 1% holding 65 times the total wealth of the bottom half of the world’s population. And as you can see from the charts below the richest 1% increased their share of income considerably between 1980 and 2012, and the wealthiest 1% in the US captured 95% of post-financial crisis growth since 2009. 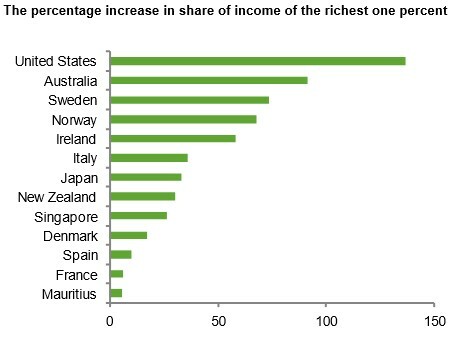 And Australia saw the second-largest largest percentage increase in the income share of the richest 1% of the population between 1980 and 2012. 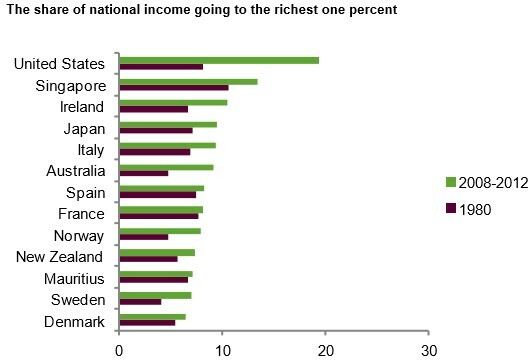 In 2012, 10% of Australia’s wealth went to the richest 1%, which is double what it was in 1980. In the United States, the most unequal society studied, nearly 20% of the country’s wealth went to the richest 1% – in 1980 it was just 10%. Some economic inequality is essential to drive growth and progress, rewarding those with talent, hard earned skills, and the ambition to innovate and take entrepreneurial risks . However, the extreme levels of wealth concentration occurring today threaten to exclude hundreds of millions of people from realizing the benefits of their talents and hard work. 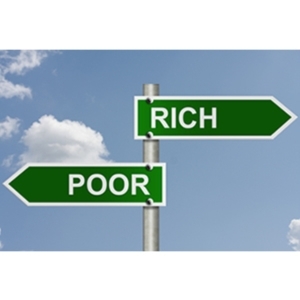 Extreme economic inequality is damaging and worrying for many reasons: it is morally questionable; it can have negative impacts on economic growth and poverty reduction and it can multiply social problems. Oxfam is concerned that, left unchecked, the effects are potentially immutable, and will lead to ‘opportunity capture’ – in which the lowest tax rates, the best education, and the best healthcare are claimed by the children of the rich. This creates dynamic and mutually reinforcing cycles of advantage that are transmitted across generations. The charity says the trend can be reversed, as it has been in the past. “The US and Europe in the three decades after World War II reduced inequality while growing prosperous. Latin America has significantly reduced inequality in the last decade – through more progressive taxation, public services, social protection and decent work. Fortunately in Australia we’re amongst the wealthiest people in the world and luckily there are very few poor people in Australia. In other words the difference between our riches and poorest is nowhere near as big as in other countries. Having said that the way to improve any inequaility is to increase the standard of living for the lower income people, rather than dragging down the income of the wealthier group. Fact is: there will always be a difference between wealthy entrepreneurs, business people and investors and the average Australian. This is not an judgement of people, but a comment of the amount of assets they’ve managed to accumulate. Before you judge me, if you’ve been following my blogs for a while you’re realised that I know there is a lot more to true wealth than just money or properties. 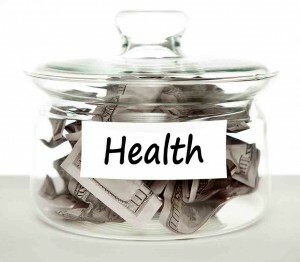 To be truly wealthy you need time (to appreciate what you had for breakfast), health (to be able to enjoy your wealth) friends and family to share it with, spirituality and the ability to contribute back to the community. I firmly believe there it is an obligation of the wealthy to continue to donate to charities and contribute to allow others to enjoy their lives to the fullest. In fact when you do this it makes you truly wealthy. Look at the daily news: more regional wars, more refugees, more fossil fuel exploitation, more deforestation — sometimes less than past years but still going ahead at a horrendous pace when they should actually be restored — continued overfishing and animal extinctions, more vast methane releases as regions get warmer due to economic expansion, more flood, drought and expanding deserts, increasing social isolation due to computers and so-called social media, more people — 7.2 billion people and growing compared to a half billion five hundred years ago — etc., etc., etc. Things are visibly getting worse and worse, yet politicians claim things are slowly getting better. Nothing can significantly slow what I prefer to call climate change in my or your lifetimes after which it will be to late to save ourselves — nothing, certainly not politicians and the economic systems they not only support but insist must be expanded sustainably, the horrible word that means more and more of everything. A horrible, horrible word that is similar to the word torture. Is there hope? I would say not much of a chance unless nature intervenes and restructures the planet. And you know what that means! I rarely comment on your blogs because I generally agree (I’m a property development manager). This is no exception: I agree with everything you say. Many wealthy people believe though that poor people are poor because they don’t want to work hard (or smart), and that their million dollar per annum income is a direct result of their cleverness, so they see helping the poor as a “handout” not representative of effort and the Australian work ethic. The truth is quite different. Most poor people work just as hard as rich people, but through lack of entrepreneurial spirit, bad luck and lack of education and cultural mores that alienate their thinking from investment, they do not achieve financial wealth. Thus giving them tax relief and benefits is simply correcting our system to comply with what we collectively consider a “fair go”. The 2nd point I want to make is that the optimum wealth distribution variance for a better economy is far less variance than we have at present, because its clear that when, in the past the variance was less, our economy was better. Clearly when wealth is distributed more, there is more spending by more people, thus improving business. This leads me to think that the super wealthy and the power brokers of Australia are losing sight of this bigger picture: that our country needs improved wealth distribution to increase discretionary spending and thus increase business.